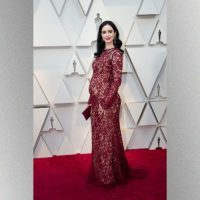 ABC/Rick Rowell(LOS ANGELES) — Krysten Ritter is pregnant, and she made the big reveal in a big way — on the Oscars red carpet Sunday night. The Jessica Jones star showed off her baby bump in a long-sleeved lace burgundy gown. She’s expecting her first child with her boyfriend, The War on Drugs frontman Adam Granduciel. Granduciel was her date to the Oscars ceremony. Last week, it was announced that Jessica Jones’ upcoming third season would be its last on Netflix.